I hope you all had a good one. Ours was quiet and homely – just the way I’ve always preferred them. And here we are in 2014! 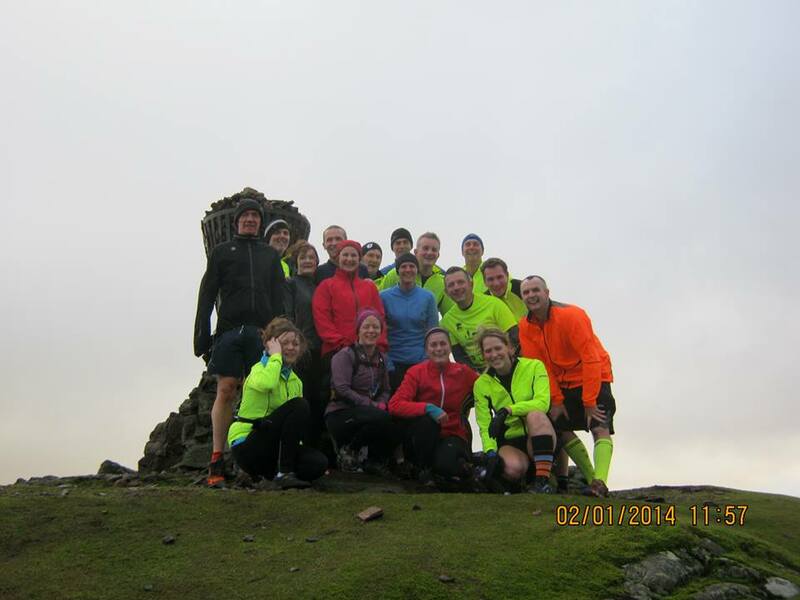 I kick started the year with a club run up Dumyat – a fairy small (418 metres high) but pretty hard going hill, on the 2nd of January. I met a few club mates and ran the 5 miles from Alloa down to Logie Kirk in Blairlogie, where we were meeting the rest of the club. My run down started off very uncomfortably and I struggled to keep up with the others but I put it down to lack of sleep and a bit too much Christmas pudding. I would shake it off quickly enough…. wouldn’t I? After meeting up with the others we started our ascent up to the summit, some running the whole way like the mountain goats they are, others taking their time and running bits, walking others. The path starts off on a very, very steep hill up through a forest and straight away I was exhausted. This wasn’t like me and I was starting to get a bit concerned! I made it up and we posed for some photos on the very windy summit before starting the heart stopping descent back down to the car park. I think nearly everyone had a least a little slip, some much worse than others as we found ourselves running down a river back to the bottom of the hill! Summit of Dumyat. Windy and cold and a perfect way to start 2014! Picking things out of my sock after a rather muddy slide down the hill. All part of the experience! A few days after my Dumyat hill run I went out for a run on my own to try and get the miles back up again. I’d tried to participate in the Marcothon but half way through December I got the cold and was far too shattered to carry on. I got back to my running about a week later but I was still running really slowly and my mileage was really low. 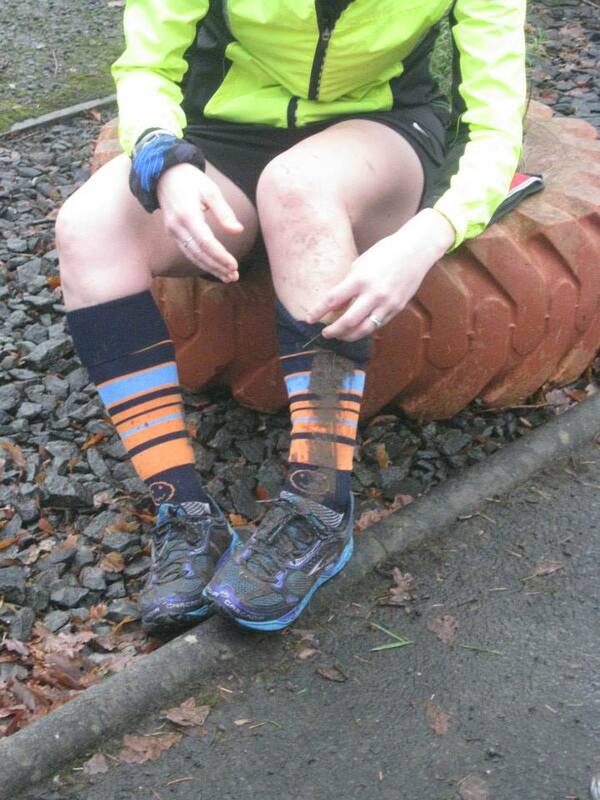 At the time I put it down to just being really tired as it was the end of term, I was really busy running courses and I hadn’t really given my body time to recover at all post Ultra. I thought all of these factors had lead to my body just refusing to do very much so I didn’t think much more about it and thought I would get better as the weeks went on. The next few days passed and I was still overly, uncharacteristically tired. I knew something wasn’t right and I was trying to think what I had done differently and that’s when I realised it must be the tablets I had been taking for an infection in my toenails. Sorry if talk of feet grosses anyone out, but I feel this is quite an important thing to bring up, especially as none of the side effects were explained to me by my GP. 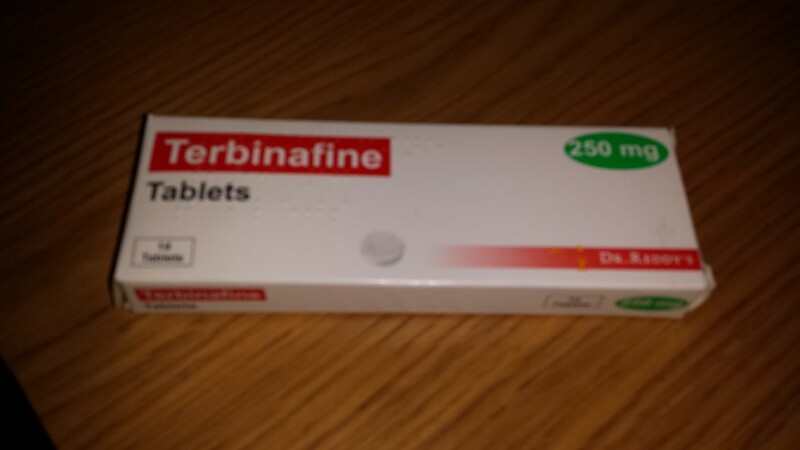 For the past month or so I’ve been taking Terbinafine tablets and when I went to the doctors to pick up my prescription I was in and out in 2 minutes, him telling me this would be the best option as the medication would be in my system (as opposed to a paint you apply to your nails daily) and would get to work a lot quicker than any other option. When I look back at my Garmin splits for December I can see exactly where I started to slow down and it just happened to be a week or so after I started taking the tablets. I looked up the side effects on line and the first things that cropped up were “chronic fatigue” and “breathlessness” – exactly how I’d been feeling when I was running and I had also noticed I was finding it harder to get up in the mornings, but again I just put it down to being the end of term and my body having just had enough! I couldn’t believe my Doctor hadn’t told me about any of these side effects and the more I looked into it the angrier I got. People in my running club had also had the same problem but they had been warned of the side effects (liver damage and change in taste also being common ones) and had all opted for the paint. Terbinafine. I’m sure not everyone will suffer the same side effects I did, but just to warn anyone who might take it – it feels like you’re running in glue! At least I knew why I was running so terribly after having such a successful year, but I was so annoyed and disheartened that all my training had basically been taken away and I was starting from scratch. 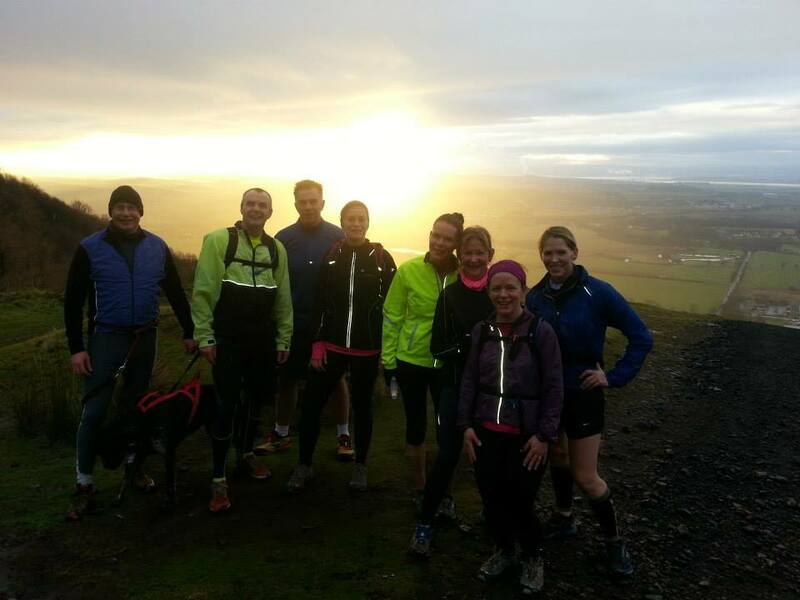 Last weekend I joined the club for another hill run in the Ochils. I’d stopped taking the tablets but I knew it would still be in system for the next few weeks, so I thought I’d go along and do what I could. It was amazing and tough and absolutely freezing, but one of the most enjoyable runs I’ve done in a long time. I’m so lucky to have all these routes on my doorstep, I just have to become good friends with hill running and not see it as a chore! 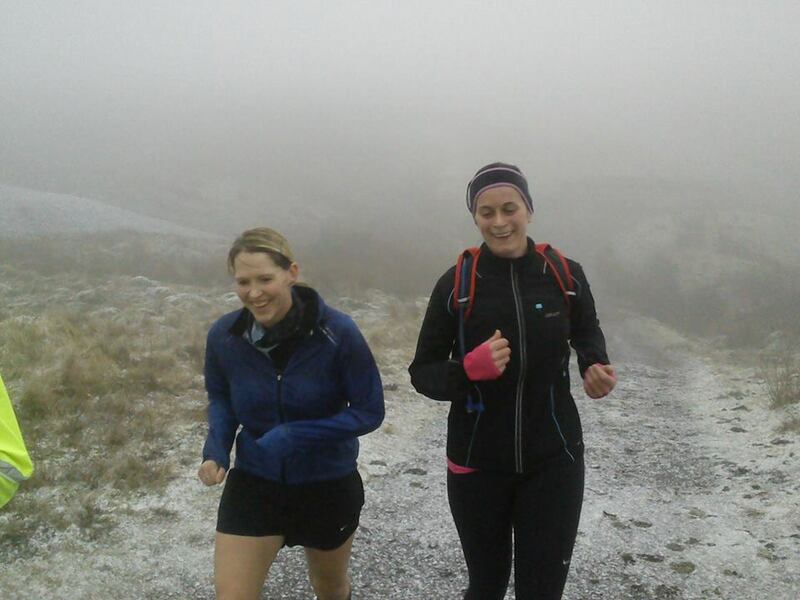 Karen and I running in the snow up the Ochils. Of course I’m wearing shorts, what else?! Half way up our first steep climb. There were many, many more! My first race of the year is just over a month away (the Devilla 15k) and I’m hoping to be back in tip top condition for it. I did my first long(ish) run of the year today, a mere 12.5 miles, but we managed to keep our pace to around 8:30 minute miles which considering how I’ve been feeling the past few weeks was a big push. I’m following the Hal Higdon Intermediate 2 training plan in advance of my next marathon, which will be at Lochaber in April, and so far so good. I’ll see how the long miles feel next weekend and then I’ll know for sure if it was the tablets that made me feel like that or not. I can’t think of anything else it could have been though!